In a web-obsessed world, it makes sense in terms of marketing to showcase your brand where your current and potential followers are already looking. Cue the benefits and necessity of digital marketing to stay ahead in today’s fast-paced media environment. Despite digital’s dominance, some businesses are still wary of its efficacy, suggesting that perhaps it is just not right for their business models. However, if you have yet to realize success with digital marketing, you may just not be doing it quite right. 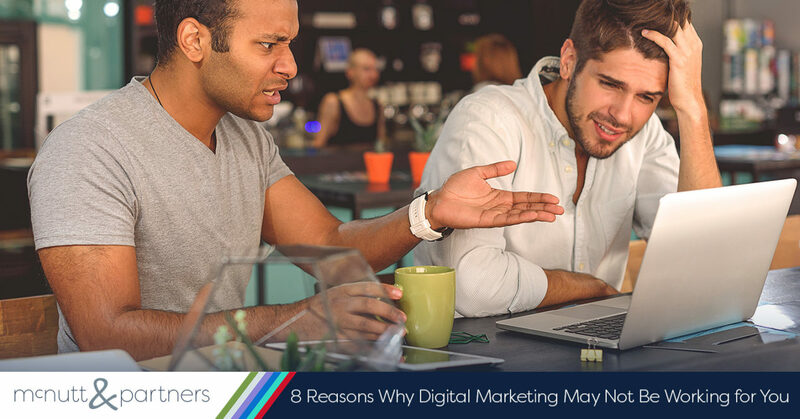 Here are a few reason why digital marketing may not be working for you. You don’t have a strategy. If you don’t have any type of digital marketing strategy at all, then you can’t have a successful strategy. Entering into digital marketing without a plan will ultimately leave you spending money unnecessarily without seeing the results you desire. You need to have a plan of attack before starting any digital marketing campaign. You haven’t defined any goals. Included in forming a digital marketing strategy is outlining the goals that you want to achieve. Do you want to increase web traffic? Grow your social media following? Climb in the search rankings? Without defined goals, you will have no clear direction. You can’t decide what strategies to implement if you do not know what you are trying to achieve. Your expectations are unrealistic. Setting goals is one thing, but you also have to make sure they are realistic goals. For example, you can’t expect to go from page 10 of Google search to page one overnight. The effects of digital marketing take time to work their magic. You’re impatient. Unrealistic expectations leads us to our next point. Digital marketing may not be working for you if you have not given it adequate time to do so. A common mistake is when businesses end their campaigns early simply because they get frustrated at the time it is taking them to achieve results. Don’t expect earth-shattering results in a matter of weeks, or even months. Give it time. You are prioritizing quantity over quality. If you are pushing out digital content on a regular basis—that’s great. But 20 posts that consist of poor-quality content are worse than one good one. While creating content on a regular basis is key, it will not help you if it is not also quality content that your followers want to consume. You aren’t actively promoting your content. Part of being successful with digital marketing requires you as a business to take an active role in promoting your digital assets. Do not simply write a blog post, put it on your website and let it sit stagnant. Instead, you need to push it out via social media, email, etc. Another effective way to promote your content is to pay to promote social media posts so that they will be seen by more users. You are resistant to change. Sometimes it can be difficult for longtime business owners to break from their traditional ways of doing things and open themselves up to new marketing ideas and methods. If you refuse to adapt to current marketing trends, it will likely not bode well for your business in the long-run—especially if you strive to continue to be relevant to up and coming generations. Change is inevitable, so don’t shun digital marketing just because you are new to it. You haven’t consulted an expert. Especially when dealing with unfamiliar territory, it pays to get professional help. Working with an individual or team of individuals who has/have devoted his or her/their careers to studying the most effective ways to implement digital marketing for clients will only benefit the growth of your business, considering that person or persons is/are competent. Digital marketing may not be working for you currently, but it could very well be due to one of these barriers. As the way people consume information continues to evolve, adapting digital as marketing medium will have to happen sooner or later if you want your brand to be successful.